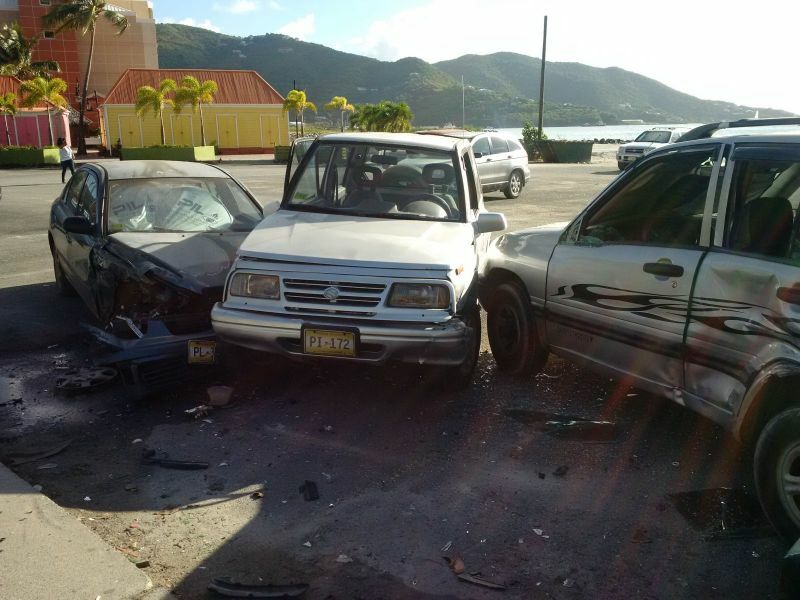 ROAD TOWN, Tortola, VI- What caused the collision is unknown at this time but three vehicles were spotted close together with damages in the parking lot opposite Pussers in Road Town. One SUV was sandwiched between a car and another SUV. From all indications, it appears that the vehicles were parked when they were hit sometime last night, December 3, 2016. It is unclear whether anyone has been hurt in the smashup. shooting them up and denting them up, what next? simply file claims and split the proceeds 3 ways and have an enjoyable holiday season!!!! getting back to the same old ways, car and fire. getting back to their same old ways, car and fire. There goes more cars and going bankrupted businesses. The vehicle in the middle was parked when the accident happened. All the vehicles were parked when the accident happened. track down license plates and fine them for leaving the scene of an accident.